NEW ORLEANS – Men’s finalists for The Bowerman were announced Thursday by the U.S. Track & Field and Cross Country Coaches Association (USTFCCCA). 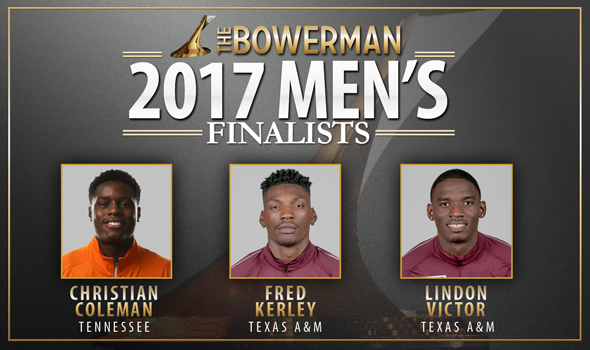 Tennessee’s Christian Coleman and the Texas A&M duo of Fred Kerley and Lindon Victor were chosen by The Bowerman Advisory Board as the most outstanding male athletes during the 2017 collegiate track & field campaign. The Bowerman Advisory Board is an 11-person panel of track & field experts from around the nation who selected the finalists based on performances recorded during the 2017 indoor and outdoor track & field seasons. Only performances through the conclusion of the NCAA Division I Outdoor Track & Field Championships were eligible for consideration. Coleman, Kerley and Victor will be celebrated on Friday, December 15 at the annual USTFCCCA Convention in Phoenix, Arizona, at the JW Marriott Desert Ridge Resort & Spa and one of them will take home the highest individual honor in collegiate track & field that night. CLICK HERE to read more about Christian Coleman. CLICK HERE to read more about Fred Kerley. CLICK HERE to read more about Lindon Victor. Fan voting is now open and can be found if you CLICK HERE. You are limited to five votes per day on each gender. Bill Bowerman served the sport of track and field in numerous ways. His leadership in the USTFCCCA’s predecessor organization, the National Collegiate Track Coaches Association, and his contributions to NCAA track and field and the running community as a whole are among his many lasting legacies.